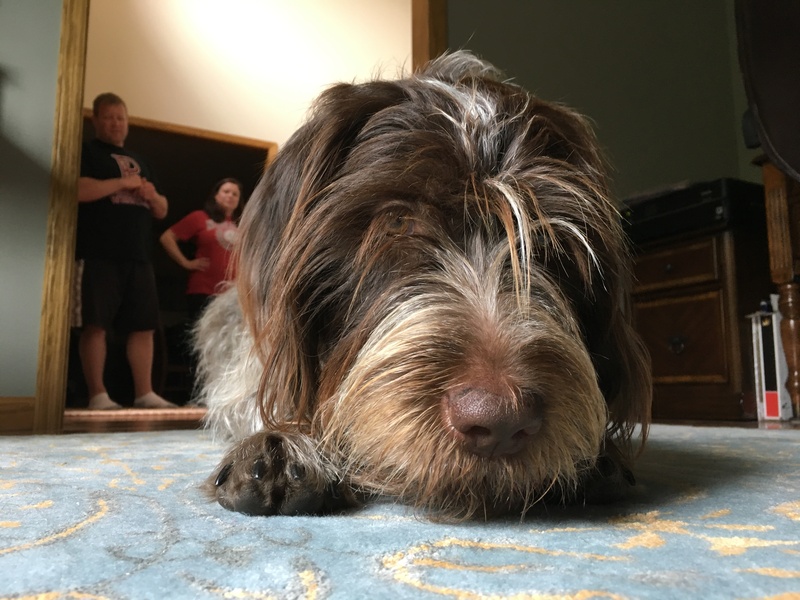 Maggie is a two-year-old Wire Haired Griffin in Omaha who like to jump up on people, doesn’t respect personal space, only listens to the family’s father (most of the time) and occasionally nips kids gloves and feet. Maggie was very well behaved for my arrival; greeting me with her nose, respecting my personal space and no jumping. This was a very promising way to start a session. However as soon as I sat down with Maggie’s guardians to discuss the situation, she started to get a little bit more excited; jumping up on me, invading my personal space and nudging me for attention. The family’s mother had attended one of my dog behavior workshops and was practicing many of the techniques that I had suggested there. However as our conversation continued I noticed that the husband was not following suit. Because Maggie was closest to the family’s father, it’s going to be more important that he Pet with a purpose than anyone else in the home. However, the technique is much more effective when EVERYONE is on the same page. That means EVERYONE needs to stop petting Maggie when she demands it and instead give her the counter order to sit before they pet her. This seems so simple, and it is. It is also powerfully effective when everyone practices it in a dog’s home. Next we discussed Maggie’s habit of liking to chew up shoes and other inappropriate items. Usually dogs chew out of boredom or to self soothe when they are stressed out. Because Maggie seemed pretty confident and self assured, its most likely due to boredom. Additional training and more exercise will go a long ways towards curbing her boredom. Another factor to consider are the toys that the dog has to play with. Not all dog toys are the same. Some dogs are more intense chewers and others not so. Maggie is most certainly in the advanced chewer stage so I took a look at Maggie’s dog toy options and found that they could be augmented. Now as I mentioned earlier providing Maggie with additional appropriate chew items is not going to completely curtail her bad habit of chewing (but it will certainly help). It became clear throughout the session that Maggie very much considers herself equal in status to the adults in the home. Most clients I work with have few if any rules for the dog, but because one of the guardians attended one of my workshops, they had incorporated a few good ones. But there was room for more growth for Maggie so I suggested a few additional rules; one of which would be to not allow Maggie up on the furniture for the next 30 days. And then after the 30 days, only with an invitation each time. When dogs live in groups, how high they set amongst their peers is an indicator of their status and rank. By making all the furniture off-limits for 30 days, and enforcing this rule anytime Maggie attempts to bypass it, her guardians will be able to communicate that the dog has less authority than they do. I also suggested that they pay attention to the little things; asking the dog to come to them rather than going to the dog, walking through the dog rather than around it, having the dog pass through doors after all the humans, adding structure to feeding time and always following through when they give the dog a command. If you give a dog a command and it walks away without complying, over time this communicates to the dog that listening to the humans is elective. But if Maggie’s guardians start to consistently follow her methodically and not give up until she complies, she will quickly get understand that when they give her an order, it’s going to happen sooner or later. This causes the dog to develop more respect for the humans as authority figures. Next I went over a Leadership Exercise that I developed a couple of years ago. This exercise helps the dog practice controlling itself while helping humans practice using a set of escalating consequences that I use to disagree with the dog. I have been doing this exercise for years and Maggie showed an incredibly high level of intelligence for how quickly she figured it out. Usually I have to repeat the exercise multiple times before the dog gets the message. Maggie understood it within about 45 seconds the first time! Because she has such a high level of intelligence, I suggested that the guardians assign their children the task of selecting eight new commands or tricks to teach her (one per week). When a human teaches a dog, it helps develop a healthy leader / follower dynamic. By requiring the families children to be the one to instruct the dog, they will deepen their bond with Maggie and also help her learn to defer to and respect them as authority figures. After completing the leadership exercise, I spent a couple of minutes going over instructions on how to make it more challenging for Maggie. Its going to be important for the family to practice this exercise multiple times a day until they are able to reach the 15 minute mark, preferably within the next 7-10 days. Because Maggie sometimes jumped up and got excited at the door, I had the family’s father head outside to play the part of a guest so that I could demonstrate how they could use the same techniques to communicate that the dog was to stay behind a boundary 10 feet away. Because security for the group is a job usually handled by an authority figure, taking over this task will go a long ways towards helping Maggie identify as more of a follower. I suggested that the family’s mother and father text or call one another when they are getting close to home so that they can practice this technique. Most dogs get this and start standing behind the border within 6 to 12 practice repetitions. But based on how intelligent Maggie is it may not take that many repetitions. By the end of the session, Maggie had stopped jumping up on people, was showing respect for their personal space and no longer protesting when corrected. Because of her unusually high intelligence, I suggested that the family look into getting some interactive dog toys and research mental stimulating games online to look for other ways to challenge their dog. The more they feed her brain, the more she will look to them as a mentor of sorts. If the family’s father consistently applies the Petting with a purpose methodology and everyone enforces the new rules and techniques, Maggie’s days of being so determined and defiant should quickly come to an end.